Mergers & Acquisitions : Advisors M.E. Covering the entire M&A cycle and advising sell side and buy side clients. We advise clients over the various aspects of a potential deal and our services cover the entire M&A cycle from preparing the company for raising capital to identifying potential investors and negotiating the optimal value and terms for the proposed transaction. 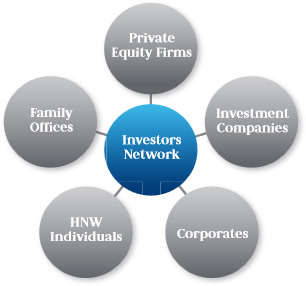 We have a strong investor network comprising of private equity firms, investment companies, family offices, high net worth individuals and business conglomerates. We leverage our investor network to identify potential investors that would be best suited for each specific acquisition opportunity.